Sprecher + Schuh’s L8 series protectors provide supplemental over-current protection for control circuits, solenoids, actuators, appliances, business equipment and a several other applications. These are designed for high performance current limiting devices for equipment installations global. The L8 series supplementary protectors are available in 20 different current ratings from 0.5A to 63A, in one, two or three pole configurations and have over 180 full compliment base model accessories. These devices can be used in applications up to 480V AC and 48V DC with interrupting capacities up to 10kA. L8 supplementary protectors are available with three different tripping characteristics. Type B- Designed to protect conductors and low level signal devices such as PLCs. Trip is 3 to 5 times the rated current of the supplementary protector. The fast trip time of devices minimize damage to control circuit conductors from low-level faults. Type C- Engineered for applications with moderate inrush currents such as lighting, control circuits and coils, computers and appliances. Trip is 5 to 10 times the rated current of supplementary protector. The higher instantaneous trip level prevents troubled tripping, and components being protected can typically withstand higher fault currents without being damaged. Type D- Developed for applications with high inrush currents, such as; transformers, power supplies and heaters. Instantaneous trip is 10 to 20 times the rated current of the supplementary protector. The high instantaneous trip level prevents troubled tripping, and components being protected can withstand higher fault currents without being damaged. The L9 line of circuit breakers are designed to provide a variety of product configurations, with current ratings of 0.5A to 40A with voltage ranges of 240V AC and 480Y/277V AC. The L9 series are DIN-rail mounted with a similar widths and current ranges of Sprecher + Schuh’s circuit breakers. Benefits provide listed branch circuit protection circuit breaker for US/Canada applications. The L9 series line are thermal magnetic (inverse time). 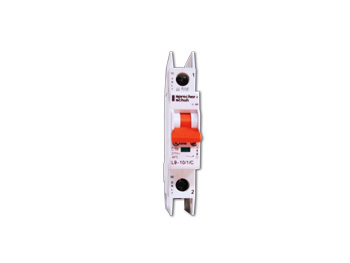 These products offer a compact design and are used for control circuit applications where branch circuit approved circuit breakers are required. The use of these products are used for protection of PLC I/O, solenoids, power supplies and control transformers. The L9 circuit breakers for Branch Circuit protection are available in 1-pole, 2-pole or 3-pole construction and are rated 0.5 to 40A at 240VC AC and 0.5 to 32A at 480Y/277V AC for North America applications (UL 489 and CSA 22.2 No. 5.1). Products are rated 415V AC 0.5 to 40A for IEC applications.